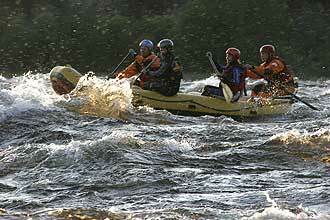 CreActive arrange rafting tours and expeditions on the mighty rivers of Lapland. We provide you with all necessary equipment and you don´t need any skills to be our guest, we will take good care of you and give you a great experience of the wild rivers in the North. Our white water adventures are recommended from 15th May – 1 st October 2019. We only provide booked tours with a miniumum of 4 paying guests. Duration: 4 – 6 hours with BBQ. 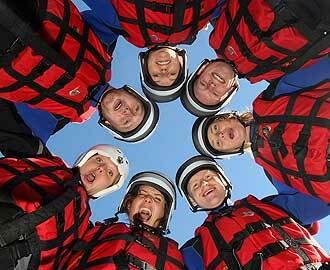 Included: Professional guide with security equipment, personal rafting equipment and lunch. Good to bring : swim shorts or bikini, towel. CreActive guides welcomes you at the start point in the river in Råne or Kalix river depending on season and water levels. We equip you with wetsuit, wetshoes, dry jacket rafting vest and helmet. One hour Safety and paddle instruction with river swimming before we enter the river in the hot dog canoes. Rafting is in rapids in river class II-IVwhich means a lot of fun and a really wet experience with a lot of adrenaline and action. The inflatable canoes gives the most intensive rafting experience since you and your friend is maneuvering the canoe yourself. Guide in security kayak is ar your assistance all the time on the water. We make a break in the paddle adventure for wilderness BBQ on the riverbank . Price :SEK 1395 per person. 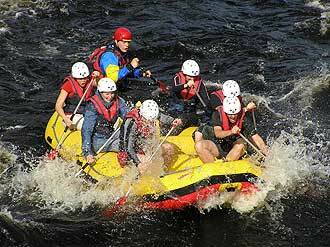 Included: Professional guide with security equipment, canoe, personal rafting equipment and lunch. CreActive guides welcomes you at the start point in at burmabridge road 45. In this tour we demand good physics since the rafting tour is in riverclass IV -V. We equip you with wetsuit, wetshoes, dry jacket rafting vest and helmet. One hour Safety and paddle instruction with river swimming before we enter the river in the hot dog canoes. Rafting is in rapids in river class II-IVwhich means a lot of fun and a really wet experience with a lot of adrenaline and action. You will paddle big stoppers over riverdrops and intensive paddling in the blue green heavy whitewaters of the mighty Pite river. Stop for lunch on the riverbank. We end the day with some river surfing. Included: Professional guides with security equipment. personal rafting equipment and lunch. 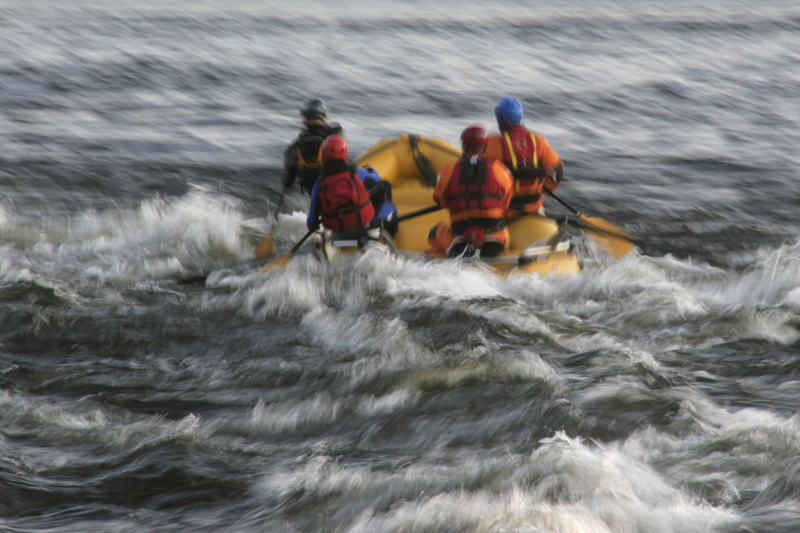 We are licensed and registered by the maritime society for rafting with international standards. All our guides have long experience and the best education possible to give you a memory for life when joining us in our white water adventures. 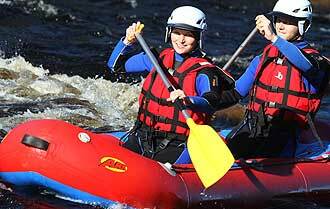 As our guest you are insured during all our white water adventures. 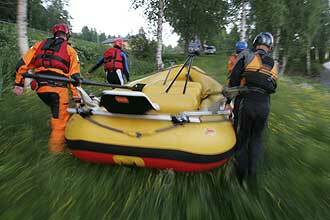 The best rafting expedition you can get in Swedish Lapland. Helicopter out and 5 days on the beautiful and wild Kaitum River. 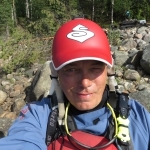 Overnights in tents on the riverside, paddling the best rapids in Lapland.